Hello everyone! This week has been a bit of a hectic week. The first week of the month is normally extremely busy for me at work and so I’m extra tired. Which means there was hardly any reading and no blog posts. Oopsie! Also, at the beginning of the week my laptop kind of broke. So, I didn’t really have a computer to do anything on if I had the time. We went yesterday and bought a new computer. I’m already in love with it and I’m currently writing this post on it. It’s a desktop. I didn’t even know how much I missed sitting at a desk and doing computer-like things. I was using our kitchen table for a desk. Not very nice. Anywho, I got a new desk and a new computer this week. I’m super happy about this. We also started a garden! When I say “we” I actually mean Julian. I wasn’t trying to get dirt all over myself. It was fun watching him though. I can’t wait to see how everything grows. We’re not only trying to grow beautiful flowers, but we are trying to grow two pineapples and some broccoli. This is just practice for when we can buy a house and plant a whole bunch of flowers and food. All The Little Lights by Jamie McGuire: I won this book on an Instagram giveaway hosted by @yabookscentral. I was originally planning on getting this book on VeryDice when I had enough tickets. Luckily, I won’t have to wait for it. I’m really excited to read this book. I’ve only read one other book by Jamie McGuire and I loved it. I only hope this book will be just as good. The Wicked Deep by Shea Ernshaw: This book was amazing. I loved it. I definitely think I would have loved it even more if I read it during October, closer to Halloween. It’s not a spooky book by any means, but I associate Halloween with witches. Anywho, read it. You will love it. 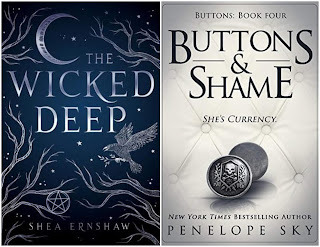 Buttons & Shame by Penelope Sky: I decided to pick up a book in this series again. I wasn’t as happy with this book but I am definitely glad Cane is getting his own story. I’m not entirely sure when I plan on picking up the fifth book. We shall see. What did you read this week? What books did you buy? Did you do anything exciting?